Jo Malone first created Nectarine Blossom & Honey twenty years ago, however the scent was set aside and forgotten, until, according to Malone herself, “two distinct moments acted as a sensory reminder- a taste of peach sorbet whilst I was dining in a New York restaurant and the scent of fresh nectarines at a London fruit and flower market.” Jo Malone has recently resigned from the post of the creative director of her company, and I can’t help but perceive this scent as a kind of a “swan song” on her part. To me, Nectarine Blossom & Honey perfectly showcases the features that make her fragrances so very attractive and so very ‘Malone”. It was Chandler Burr who once titled Malone a Queen of Light; even the darkest of her scents still have a wonderfully transparent, weightless quality. Other perfumes may be compared to heavy, opaque fabrics like velvet or suede, hers are the finest of silks, the most transparent of gossamers. This light touch is perhaps most evident and most magical in Nectarine Blossom & Honey, a scent that seemed to have been destined to be excessively fruity and sweet. Instead, this is another translucent, sheer, gauze-like fragrance. Nectarine Blossom & Honey may have been inspired by peach sorbet, but there is nothing foody in this fragrance. It is undeniably delicious, with peaches and nectarines being juicy, fresh, and mouthwatering, and yes, perhaps there is a certain gourmand aspect here, but that gourmand quality is of the most abstract kind. 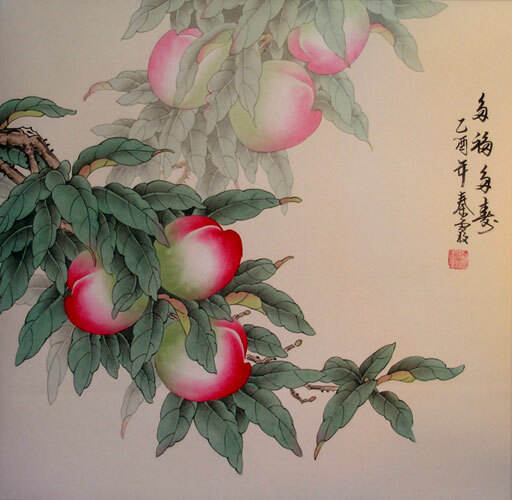 In the same way one might salivate looking at an exquisite painting of the fruits, done by a Chinese artist. Every detail is distinct and yet the stroke of the master’s brush is so light, so delicate, it makes the objects hauntingly illusory. “The dewy green notes” promised by the official description are indeed quite evident here; one smells not just peaches and nectarines but the leaves and branches as well. These green notes, along with the vetiver in the drydown, balance the fruitiness beautifully. The scent becomes drier and even somewhat earthy as the scent develops, but it never loses the delectable accord of peaches and honeyed citrus fruits. The fragrance does not quite have the tenacity of Jo Malone’s most long-lasting scent, Pomegranate Noir, but it does last at least seven-eight hours on my skin. Nectarine Blossom & Honey is now my favorite Jo Malone scent and one of the most favorite citrusy-fruity florals. Nectarine Blossom & Honey is available at JoMalone.com, Gloss.com, Neiman Marcus, $50.00 for 30ml, $90.00 for 100ml. *The painting is from orientaloutpost.com. *Tomorrow- Songes by Annick Goutal. This sounds just lovely, M. Although, I must point out that seven to eight hours seems very good to me - but then fruit sometimes goes to die on my skin, so perhaps I would not get that much out it at all? I wonder what Malone will do next - one does want to see where/what she will choose to devote her energies towards now that she has resigned. This for some reason,reminds me of a comparison with the Hermessence Osmanthus Yunnan when you describe the sheerness of the scent.I have tried neither but are they comparable in lightness and are they similiar at all?You have piqued my curiousity!Thank you for a lovely review! That is a great comparison there! You are right. It is the same kind of sheer-ness (Ellena can do light and transparent very well also). Nectarine Blossom is sweeter and fruitier though, less dry. But other than that- you made a very good point! Nutmeg and Ginger- not too sweet or fruity either. Very neutral and wearable. Or- Vetiver, which is earthy-spicy-herbal? My favorite Jo Malone is French Lime Blossom, but you have to have the sweet-eatin' skin to stand it. Unfortunately the bees really like it, too. You liked this one much more than I did, M (no surprise there, LOL). Somehow I cannot work up any excitement over any of Jo Malone's fragrances. PN smelled like Christmas potpourri to my nose, Nectarine Blossom smelled like canned peaches. I would love to experience what you are describing in your review though. That sounds so lovely. What are you thoughts on Jennifer Lopez's fragrances? I like a couple of her Glow scents, but can't decide about the others. Check out my blog about her fragrances at www.beautysecrets101.com! M, You reviewed this so beautifully, it has me thinking that I need to try this in the worst way! I really don't think I've given her a fair shake and just have been bullheaded and resistant for some reason. lol Must check this one out though. I think Malone scents tend to generally work on me. Christmas potpourri? :-) I can sort of see that. Thank you for the info on your blog! "Sold, to the Alaskan woman with her credit card hanging out like a lolling tongue!!" You write about things with such economy and elegance. Thank you! You could always give it a try. I think it would be lovely in spring! Oh, wow! This sounds heavenly! Then again, most things you write about do :~D This one's going on the Wishlist! Thanks so much for the suggestions; amber and lavender sound particularly good to me. I will sniff them next time I'm in Bloomie's. You are too kind! I hope you like this one! I would like to hear your impressions of A&L. I like lavender too, but this oen was a little on the masculine side for me. I love the Nectarine Blossom scent so much! But it seems to wear off much much faster than 7 hours on my skin. Any trace of it is gone after 3 to 4 hours, and I don't know why! I seem to have to put on a lot of it as well. When I first tried it out with the tester, it lasted a long time. But with the $90 bottle, it fades away so quickly. Well, if it's any consolation, I think even 3-4 hours is a good lasting power for a Malone scent. Most of her fragrances disappear on my skin within moments of application.